Easy access to the internet onboard ships is a key requirement if young people are to be attracted into the seafaring profession and shipping needs to be more visible in the public eye. The IMO symposium provided an opportunity for a discussion on the future of maritime education and training and how it can meet the demands of the shipping industry and aimed to address the World Maritime Day theme: “Maritime education and training”, through targeted discussion on the topic: “Shipping’s future needs people: Is global maritime education and training on course?”. 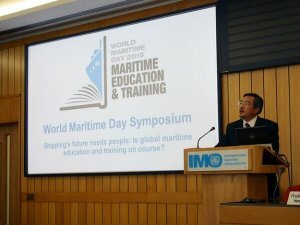 Ensuring a high proportion of students moved into the maritime professions after completing their maritime training was an important issue, according to Professor Jingjing Xu, Associate Dean, Research, Faculty of Business, Plymouth University, who said conditions for seafarers onboard needed to be appealing if the predicted lack of officers and rating in the future is to be addressed. Poor internet access on board ships was the largest disincentive to young people taking up seagoing roles, she said. Speakers from the shipping and maritime industry and academia addressed three sessions, covering: opportunities for the young generation in the maritime industry; seafaring as a profession; and developing seafarer skills through quality maritime education and training. IMO Secretary-General Koji Sekimizu, who opened the symposium, reiterated the need for high-quality maritime education and training as the bedrock of safe and secure shipping industry. Attracting new recruits into the industry was highly important, he said. Another key point stressed at the symposium was the need to raise the profile and the image of shipping in general, in order to attract young people into the maritime professions. Opinion formers, including teachers and politicians, including those managing education policies, were key targets who should be informed about shipping and the maritime world. Other speakers brought up the paucity of training berths. A cadet, one of 32 cadets from 16 countries attending the symposium, highlighted the fact that her country did not have training ships to offer seagoing experience, so this was a key issue which needed to be resolved so that their training did not go to waste due to lack of sea experience. Government policies, particularly those of flag States, at national level could impact on maritime education and training and on recruitment. The percentage of women seafarers was still very low and this was still a matter than needed to be addressed. The issue of ongoing quality assessment of seafarer training courses, as required under IMO’s International Convention on Standards of Training, Certification and Watchkeeping for Seafarers (STCW) was also raised. Following a career at sea, former seafarers needed to be supported into maritime careers onshore, including any necessary re-training. Summing up, IMO Assistant Secretary-General Andy Winbow said shipping clearly needs people and its image – or lack of one – to be addressed.